Includes All 3 Products – Cost Per Day $2.80! Radiance 1oz., Infusion 02 .5oz. (all skin types). Cell-Tight 1.6oz. (specific to skin type). Upon purchase you will receive the following coupon on your next order! Power Trio is a new range of cosmeceuticals, developed in our own state-of-the-art, in-house laboratory. In this package of professional skin care products, you’ll receive Radiance, Cell-Tight, and Infusion 02. This professional skin care trio is formulated with 14 active ingredients to minimize the appearance of wrinkles, tighten, hydrate and rejuvenate the skin. The Power Trio skin care products have been dermatology tested and are safe for all skin types. Achieve significantly more results than those obtained by conventional skincare. After 7 days, see a brighter, more revitalized, youthful appearance. With continued use you can expect improvement in the most visible signs of skin aging: wrinkles, fine lines, enlarged pores, dryness, redness, discoloration, uneven skin tone, puffy eye bags, dark circles, loss of firmness and elasticity. 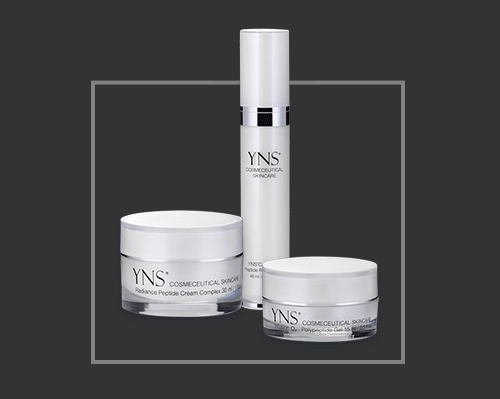 Anti aging wrinkle cream complex contains 28.5 percent concentration of five peptides. Matrixyl Synthe’6 to replicate a filler effect to reduce fine lines and wrinkles; SYN-COLL and Platinum-Matrix-em to increase skin elasticity and firmness; neuropeptides Leuphasyl and Argireline for reduction in the depth of wrinkles and hyaluronic acid to provide moisture, plumpness, and suppleness to the skin. 23 Percent Peptide Retinol Serum. Peptide retinol serum is a 23 percent blend of peptides Serilesine and Platinum Matri-xm to increase skin elasticity, density and skin compactness; Renovage to extend cell life, plump, reduce wrinkles, sun spots, and redness; and the next generation retinol encapsulated for controlled release upon contact with the skin. This latest retinol is non-irritating, non-peeling without compromising efficacy allowing applications of vitamin A twice a day; use directly under eyes to improve skin texture, firm and tighten. Retinol concentrations are formulated at .15 percent for sensitive or dry and .2 percent for normal or oily skin types. Polypeptide gel is a 38 percent concentration of four peptides SYN-AKE, Inyline, Eyeseryl and Haloxyl to prevent skin wrinkling, treatment of under eye bags, reduction of dark circles, improvement of skin elasticity; and Perfluorodecalin latest anti aging ingredient to increase oxygen levels resulting in ultra skin hydration and the reduction of depth and number of wrinkles. As a superior skin care company, we understand you don’t trust everything you read online, especially when it comes to something so serious as making you look younger. By compiling data for our consumers, you can make a more executive decision on whether our top skin care products are the right investment for you. You can know everything you need to about our skin care products, but without seeing the results yourself you won’t be convinced. The Power Trio is manufactured in the USA by YNS Med Spa, Inc. and has been dermatologically tested by Evic Brazil an International Group investigation center with locations around the world. Below is data that supports our claims. 28.5 Percent Peptide Cream Complex. Argireline applied twice daily was observed that severity of wrinkles around the eyes decreased up to 17% after 15 days, and up to 32% after 28 days. Matrixyl Synthe’ 6 rebuilds the skin network by increasing three kinds of collagen I, III, IV to significantly reduce wrinkle severity. In addition, Matrixyl synthe’6 stimulates hyaluronic acid and laminin 5 which replicates a filler effect and fibroncectin increases skin elasticity to restore volume. Leuphasyl three tests were performed with 5% Leuphasyl and 5% Argireline applying the peptide cream twice daily. After 28 days, combining both Leuphasyl and Argireline together showed a reduction in the depth of wrinkles of 25%, with maximum values of 47%. SYN-COLL proven anti-wrinkle effects were tested at 2.5% and were a applied twice daily for 84 days. SYN-COLL showed a visible improvement of 36% relating to anti-wrinkling effects. Platinum Matri-xem is one of the latest peptides on the market to have a remarkable effect on collagen synthesis. In vivo test for 30 days at .3% showed significant improvement on skin elasticity 47%, hydration 33%, reduction of wrinkles by 61%. Ingredient List Aqua, Caprylic/Capric Triglyceride, Acetyl Hexapeptide-8 (Argireline), Pentapeptide-18 (Leuphasyl), Palmitoyl Tripeptide-38 (Matrixyl Synthe’6), Palmitoyl Tripeptide-5 (SYN-COLL), Simmondsia Chinensis Seed Oil, Aloe Barbadensis Leaf Powder, Phenyl Trimethicone, Butyrospermum Parkii Butter, Cetyl Alcohol, Glyceryl Stearate, PEG-100 Stearate, Stearyl Alcohol, Sodium Hyaluronate (Hyaluronic Acid ), Sodium Acrylates Copolymer, Glycerin, Phenoxyethanol, Acetyl Tetrapeptide-17, Colloidal Platinum (Platinum-Matrix-em), Sodium PCA, Lecithin, Allantoin, Panthenol, Disodium EDTA. Renovage is one of the latest anti-aging ingredients to stabilize telomere shortening increasing cell life by 1/3. Telomeres are the cell’s biological clock regulating how fast we age. And if slowing down our cells’ biological clock wasn’t enough, Renovage firms, hydrates, plumps, reduces wrinkles, sun spots, redness and pore size. After six months, a clinical study showed pigmented spots were lessened by 56% and after 1 month, 35% increase in firmness and 45% increase in skin tone. Serilesine is a skin firming peptide that strengthens the dermal-epidermal junction resulting in increased dermis density and skin compactness. In a clinical study 10% Serilesine applied twice daily resulted in improvement in skin compactness 40%, skin tone 36%, and skin smoothness 45%. Retinol has superior hydrating effects with concentrations .15% for sensitive or dry skin types and .2% for normal or oily skin types. Retinol has been clinically proven to improve fine lines, wrinkles, skin smoothness, firmness, texture and skin discoloration. Ingredient List Aqua, Teprenone (Renovage), Hexapeptide-10 (Serilesine), Caprilic/Capric Triglyceride, Glycerin, Polysorbate-20, Tocopherol, Retinol (Vitamin A), Retinyl Propionate (Vitamin A), Caprylyl Glycol, Cellulose Gum, Lecithin, Acetyl Tetrapeptide-17, Colloidal Platinum (Platinum Matri-xem), Butylene Glycol. Perfluorodecalin superior anti-aging ingredient increases oxygen levels resulting in increased skin hydration and the reduction of depth and number of wrinkles. After 28 days of treatment containing 6% Perfluorodecalin oxygen levels in the skin increased 100%. In another clinical study containing 10% Perfluorodecalin there was a 15% marked decrease in the number of wrinkles and 32% marked difference in the depth of wrinkles. Inyline neuropeptide reduces and prevents the formation of fine lines and wrinkles. 20 volunteers applied a cream containing 5% Inyline in the crow’s feet area twice daily. After 28 days of treatment a decrease in wrinkle depth of 14.9% was determined. SYN-AKE neuropeptide reduces the contraction frequency of muscle cells on the face, thereby decreasing expression lines. In testing a reduction of over 50% in wrinkle size was reported with an immediate line smoothing activity lasting up to 6 hours. Eyeseryl tetrapeptide has a proven efficacy in reducing puffy eye bags and anti-dark circles. After 28 days, 17 volunteers reported eye bags were reduced 70% and a decrease of dark circles under the eyes showing a slight lightening effect. Haloxyl was applied directly under the eye area for 56 days against placebo on the other one. Results confirmed 72% of volunteers reported a 19.5% lightening of dark circles. Ingredient List Aqua, (Perfluorodecalin), Acetyl Tetrapeptide-5 (Eyeseryl), Acetyl Hexapeptide-30 (Inyline), Glycerin, Chrysin, Palmitoyl Tripeptide-1, Palmitoyl Tetrapeptide-7, N-Hydroxysuccinimide (Haloxyl), Steareth-20, Dipeptide Diaminobutyrol Benzylamide Diacetate (SYN-AKE), Arginine, Sodium Acrylates Copolymer, Lecithin, Butylene Glycol, Phenoxyethanol, Caprylyl Glycol. Methyl, Propyl, Butyl, Ethyl Parabens, Sodium Lauryl, Laureth Sulfate, Petrolatum, Propylene Glycol, PVP/VA Copolymer, synthetic colors and perfumes. Cleanse: Use a wash cloth; gently cleanse the skin with any cleanser of your choice. Soak: Use warm water; hold a washcloth on the face close under the eyes for 10 seconds. Pat skin dry. Use 1 pump each for lower eye areas: place 1 pump on one fingertip, up to the eyelashes. Avoid upper eyelids. Let absorb 2 minutes. Massage gently into the skin. Apply a pea size under each eye up to eye lashes, and 3 on rest of face. Use 1 pump each for lower eye areas: place 1 pump on one fingertip, up to the eyelashes. Avoid upper eyelids. With one fingertip place 1 pump on forehead, 1 pump on each side of face to jawline and chin, 1 pump above lip, 1 pump on the nose. Skin will appear wet with correct amount (7 pumps). Let absorb 2 minutes. Massage gently into the skin. Apply a pea size under each eye up to eye lashes. Note: For extra hydration apply 3 pea sizes on rest of face. AM/PM: Apply 4 to 5 pea sizes of Radiance. Note: Cell-Tight may be substituted 3 times per week at night in place of Radiance. AM/PM: Apply small amount of Radiance or Infusion 02. Do not use electronic brush devices, alpha-hydroxy acids or no rinse eye makeup remover pads. YNS recommends 100% Pure Jojoba Oil to remove eye makeup to avoid irritating your new youthful skin. If you are using correct amount of product per application you may experience a slight tingling or warming sensation for up to 30 seconds. Do not overlook to soak the skin with warm water for 10 seconds (step 1) to remove dead skin cells. If dryness or sensitivity occurs, to adjust your program, discontinue Cell-Tight for 1 to 2 days; apply Radiance AM and Infusion 02 PM. After 1 to 2 days, resume program or adjust usage of Cell-Tight to PM only application. Cell-Tight contains retinol and should not be used by pregnant or lactating women. Products with retinol increase sun sensitivity and should always be used with a sunscreen. Avoid associating retinol with the use of products that can cause irritation to the skin. It’s our experience that our customers are highly satisfied, and a big reason for that is the fact that our customers get results. If you do not experience desired results or for any reason are unhappy, we will issue a FULL refund and PAY for shipping to return the products. Simply email your request for a return shipping label and return your unused portion of the product for a full refund. With the return include a copy of your receipt (or a note with your order #, name, email address, phone number) along with the products. Refunds are processed within 5 days of receiving the returned product.